The innings in which ten fielders took a catch each remains unique. August 31, 1967. The Leicestershire vs Northamptonshire County Championship match at Grace Road could well have been just another match, but the Leicestershire fielders decided to make things a bit special. With each dismissed Northamptonshire batsman being caught by a different fielder, the innings suddenly became a statistician’s delight. Abhishek Mukherjee looks back at a bizarre match. The 1967 County Championship was approaching its end. Leicestershire and Kent were both in the hunt with 164 points, but Yorkshire were a full 10 points ahead, on 174. All three teams had a match in hand. While Kent hosted Essex at Dover and Leicestershire hosted Northamptonshire at Grace Road on August 30, Yorkshire had a week in hand: their home match, against Gloucestershire at Harrogate, would start September 6. Tony Lock elected to bat, and Mark Hallam (103) and Mick Norman (90) responded by adding 185 for the opening stand before falling in quick succession. Clive Inman walked out to join Brian Joseph Booth, not to be confused with Brian Charles Booth, who played both cricket and hockey for Australia. Six years before the match, when the Australians played their tour match against Lancashire, BJ Booth had BC Booth caught by Geoff Clayton. Inman was, of course, a different matter. He hailed from Ceylon, and led St Peter’s College, Colombo to their first win in the derby against St Joseph’s. When he joined Leicestershire, he actually followed the footsteps of fellow countryman Stanley Jayasinghe. Coming back to the match, Booth and Inman took the score to 282 for 2 before Leicestershire went in pursuit of quick runs, and Mushtaq Mohammad ran through the hosts with 7 for 75. The last 8 wickets fell for 58; Leicestershire were bowled out for 340 the second morning. The pitch promised turn, and Mushtaq’s performance only verified the assumptions. Lock had Roger Prideaux caught-behind, but his illustrious partner tore into the Leicestershire attack. 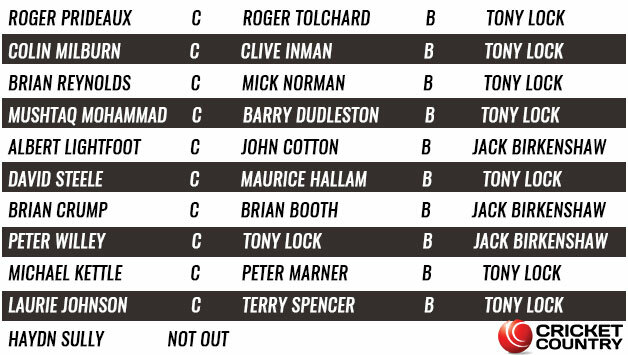 Lock also had Brian Reynolds, caught Norman, and Mushtaq, caught Barry Dudleston. The score read 94 for 3, and such was Milburn’s dominance that the three dismissed men had managed a mere 27 between them. By the time Milburn holed out to Inman off Lock he had raced to 87. 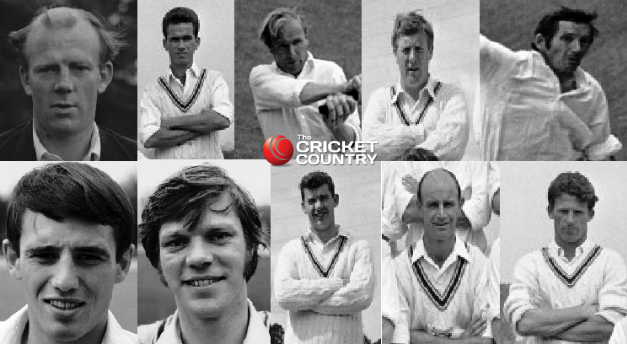 David Steele was yet to become the man who would keep the fastest bowlers at bay, but he helped Albert Lightfoot add 35 for the fifth wicket before Hallam caught him off Lock. Then Jack Birkenshaw came to the fray, having Lightfoot caught by John Cotton; he followed by having Steele’s cousin Brian Crump (caught Booth) and Peter Willey (caught Lock). Michael Kettle went next, caught Peter Marner off Lock. Laurie Johnson and Haydn Sully added 9 for the last wicket before Lock dismissed the former, caught by Terry Spencer. Northamptonshire had saved the follow-on, but had conceded a 129-run lead. Lock finished with 7 for 75; Birkenshaw, with 3 for 60. Poor Birkenshaw did not get a catch. In fact, he remained the only one in the innings to not take a catch. 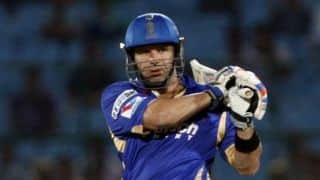 Of course, one can say in his defence that he was, after all, bowling; the same logic might have applied to Lock as well, but Lock was, of course, one of the greatest fielders at bat-pad. Hallam fell early, but Leicestershire went for quick runs. Lock set Northamptonshire 277, and Prideaux and Milburn added 50 for the opening stand. Unfortunately, they crumbled to 113 against Birkenshaw (4 for 41) and Lock (6 for 43). This time there were 8 catches, Roger Tolchard, Lock, Spencer, and Marner taking two apiece (Tolchard also effected a stumping). While all this was happening at Grace Road, Kent had wrapped things up inside two days. Essex, no match for the medium-pace of Norman Graham (6 for 45 and 6 for 35), were bowled out for 93 and 102, and lost by 9 wickets. Both teams finished on 176, edging 2 points ahead of Yorkshire. Nothing of this mattered, of course: Geoff Boycott (74) and Phil Sharpe (75) added 127, while Ray Illingworth scored 46, and Yorkshire reached 309. The rest of the match belonged to Illingworth, who, with 7 for 58 and astonishing figures of 13-9-6-7, skittled Gloucestershire out for 134 and 99. The championship was, once again, Yorkshire’s. Leicestershire 340 (Maurice Hallam 103, Mick Norman 90, Clive Inman 58; Michael Kettle 3 for 74, Mushtaq Mohammad 7 for 75) and 147 for 6 decl. (Michael Kettle 3 for 74) beat Northamptonshire 211 (Colin Milburn 87, Albert Lightfoot 47; Tony Lock 7 for 75, Jack Birkenshaw 3 for 60) and 113 (Tony Lock 6 for 43, Jack Birkenshaw 4 for 41) by 163 runs.